We love this colourful 'vintage' loft apartment located in a former language school building in Berlin, Germany. It is a really cool example of not just renovating and reinventing life in the inner city, but also promoting small living, slow living and working at home in style. The former classroom is transformed into a space to live, work, play and nourish. But, and perhaps a little ironically... we are pulling them up on one misused definition. 'The vintage loft' is technically retro style. Vintage refers to eras around the 1920s and earlier. Whereas this loft is 1950s and 60s fabulous. Whichever era it identifies with, we love its lollipop mono-tones and suburban practicality that juxtaposes with what is typical in the heart of one of Europes most hip and happening cities. It is furnished throughout with retro-inspired pieces such as tivoli lamps designed by Simon Henningsen and Eames armchairs. Cheeky contemporary pop art jumps out around every corner and yet they've managed to create an uncluttered space. Designers Vintagency have removed the doors in selected spots and painted the walls tones of white and pale blue which give the loft a wholeness, openness and sense of flowing space. The space was designed as a live-and-work loft and customizable with creative fixtures. The desk is huge and the industrial hanging lights are right overhead so the work-at-home professional will never miss a detail. Everything they need is in easy view and reach. You'll note the office space has sliding doors to shut out the chatter without having to kick of your slippers. The kitchen makes the most of a tight angled space by a window. Once again, it is super practical with a warm cozy feel that inspires simplicity, creativity and balance. It has decent storage but not huge space, and features natural worktops piled with fresh ingredients. Take your home-made stir fry and favourite bottle into the dining room at the end of a productive day as friends drop by. Entertain in your slippers. We particularly love the slick Charlotte Perriand sideboard next to the Benjamin Pistorius dining table and the textured turquoise rug. The mis-matched chair makes it all seem so organically stylish. One of its most charming elements is that it doesn't take itself too seriously. This chair looks like it's waiting for Austin Powers and the picture on the floor takes us back to the golden days of James Bond. 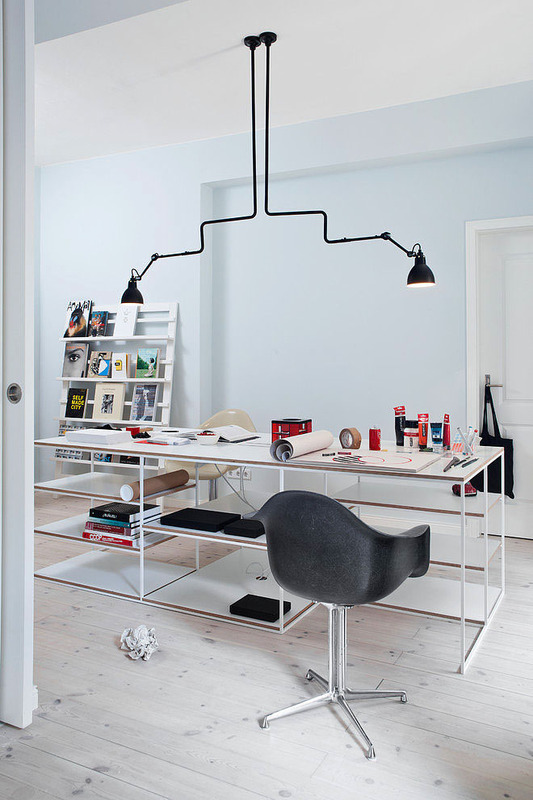 Hanging industrial lights are a feature throughout, as are the soft wood floors. Each room is a department that flows on from the last but at the same time compartmentalise the different aspects of modern life- work, relax, nourish and play. The vintage loft in Berlin was designed by VintAgency in Berlin. If you like their stuff, join them on their Facebook page, and share this post with a ready-to-go-tweet.